The sisters at Bediani in Georgia keep bees to supplement their income. To learn more about life in their community, read “Alternative Lifestyles” in the September 2007 edition of ONE. Early in the fourth century St. Helena, mother of the Roman Emperor Constantine, went to Jerusalem in search of the holy places of Christ’s life. She razed the second-century Temple of Aphrodite, which tradition held was built over the Savior’s tomb, and her son built the Basilica of the Holy Sepulcher over the tomb. During the excavation, workers found three crosses. Legend has it that the one on which Jesus died was identified when its touch healed a dying woman. Seminarians enjoy a traditional Ethiopian meal at Holy Trinity Ethiopian Orthodox Theological College in Addis Ababa. To learn more about the training of Orthodox clergy in that part of the world, check out “As It Was, So Shall It Remain?” in the September 2009 edition of ONE. Back from India’s "Red Corridor"
An Adivasi child carries his brother in the village of Bhatpal, in the Bastar region of India. In the Summer edition of ONE, Jose Kavi reports on the challenges facing sisters working in the conflict-stricken “Red Corridor.” He offers here some additional impressions of covering that story. A sigh of relief went up from me when my train crossed over to Odisha from Chhattisgarh, two neighboring states in India’s central-eastern region. My four-day stay in Chhattisgarh was one of the toughest periods in my 35-year-old reporting career. Chhattisgarh was one of the few of India’s 28 states that I had not visited until a reporting assignment took me there in March. It would be an understatement if I say I was not anxious or worried to visit that predominantly tribal state. Gathering my wits, I boarded the plane to the Chhattisgarh capital of Raipur, some 750 miles southeast of New Delhi. The aircraft was full but only a couple of the passengers were tribal. The others were non-tribals: politicians, government officers, contractors and employees of transnational firms — all outsiders who lived off the mineral-rich state. Their presence reminded me what I had read about Chhattisgarh, one of India’s states that struggled with a plethora of problems. One of the problems was the stranglehold of Maoists over several pockets in the state. In the past 20 years, the revolutionary Communist group that follows the ideals of Chinese leader Mao Zedong has killed more than 12,000 people in nine states, with Chhattisgarh topping them all. During the nearly six-hour drive from Raipur to Jagdalpur, my host Father Augustine Vadakkedom explained that the Maoists had entered the state in late 1970s to help the poor tribal and Dalit communities who had been oppressed. However the protectors mounted a full-fledged war against the government and its security forces and the two marginalized communities soon found themselves caught in the middle. Now I was wading into this troubled corner of the country. My assignment was to study the works of two Catholic women religious congregations serving Jagdalpur diocese that covers the Maoist-infested Bastar region. Father Augustine and the sisters from the two congregations took us to places where we were told the Maoists were quite active. While passing through a forest road to go to a mission station, Father Augustine stopped at the spot where a landmine explosion two years ago killed at least 27 people, many of them top political leaders in the state. A red crumbled car stood in front of the nearest police station as a mute witness to that incident. During the trip we met women such as Sister Julie Mathew who were caught in the crossfire of Maoists and security forces. Sister Julie had close encounters with Maoists at least three times. Once, she and another sister were blindfolded and taken by the outlaws to their hideouts deep inside the forests for questioning. She also told how she and some 50 hostel children faced death when Maoists attacked a police station that was adjacent to their convent. The sisters explained how they had to reluctantly close village dispensaries under pressure from the Maoists, who wanted the church people to perform abortions and carry medicines for them. But there were rays of hope in this dismal scenario. First, there is the quiet revolution the nuns’ presence is stoking among illiterate men and women in remote villages. In one village, an aged woman shared how the people used to cower at the sight of even an office assistant in a government office. But the sisters are giving the people a sense of dignity and confidence. A few days before I met them, thought, the villagers had marched to a district collector as a group and gotten him agree to give them electricity to their village. The villagers also admitted that they had strictly followed caste barriers until the sisters arrived. Now, they all sit together and seek solutions to their common problems. The sisters have taught them that is that there is strength in unity. And the task is not over yet. That is why women like Sister Julie say they would remain, whatever the price they have to pay. I let out a sigh of relief as the train chugged out of the last station in Chhattisgarh. I was comforted by the thought that there are still some people out there who are willing to risk their lives to improve the lives of others. But reminders of the risks they face are never far away. Just a few days after I left the region, the newspapers reported another ambush by the Maoists that killed at least five security persons. 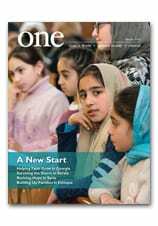 Read more about how sisters are working to change lives by “Serving in the Red” in the Summer edition of ONE. And to support their work, visit this page. "We Are Gathered in Solidarity and Witness"
In this photo from 9 September, Bishop Gregory Mansour of the Eparchy of St. Maron of Brooklyn, N.Y., and Archbishop Oshagan Choloyan, the prelate of the Armenian Apostolic Church of the Eastern United States, participate in an ecumenical prayer service at St. Joseph Church on Capitol Hill opening the In Defense of Christians Leadership Convention in Washington. Cardinal Donald W. Wuerl of Washington called for solidarity with the persecuted Christians of the Middle East during a 9 September prayer service at a Roman Catholic church on Capitol Hill. The prayer service was held in conjunction with the In Defense of Christians summit held at a Capitol Hill hotel, within walking distance of St. Joseph Church. The summit is the second for the organization, which Cardinal Wuerl noted in his reflections during the prayer service. This year, Cardinal Wuerl said, “we are gathered in solidarity and witness” again to support the region’s Christians who face “tragedy” every day. “Much, much needs to be said about what continues to happen in the Middle East,” he added. Cardinal Wuerl recalled the beatitudes, as proclaimed in English at the prayer service — but also in sung chant — by Melkite Father Nabil Haddad, founder of the Jordanian Interfaith Coexistence Research Center, and in particular, “those who hunger and thirst for righteousness.” These, the cardinal said, are today’s Middle East’s Christians. Thousands of tribes and peoples litter the pages of world history. Most have distinguished themselves as conquerors or settlers, eventually passing from the scene and leaving behind as their legacy a tablet, a ruin or a reputation. The Armenians, whose ancient homeland now encompasses eastern Turkey, parts of the Caucasus and northwestern Iran, have endured for more than 3,000 years — despite the challenges of living along the East-West trade routes. Squeezed between Asia and Europe, Armenians have outlived more powerful neighbors, who repeatedly and relentlessly sought to subjugate and even obliterate them. How have the Armenians survived, when far more powerful peoples — Romans and Parthians, Byzantines and Ottomans — vanished? Most historians would credit the resolve and resourcefulness of the Armenian Apostolic Church, a powerful faith community that has either defined or impacted all aspects of Armenian society, language and culture. Incontestably, Armenia was the first nation to adopt the Christian faith. A Roman scribe, known to history as Agathangelos, recorded the events of St. Gregory the Illuminator’s conversion of King Tiridates III based on contemporary sources more than a century after the deaths of the principals. What is not documented, however, is the origin of Armenian Christianity. Ancient tradition credits the apostles Bartholomew and Thaddeus as the source of the Christian faith in Armenia. Armenian Christian familiarity with Syriac and Greek Christian customs — before the era of Gregory — point to Armenia’s links to the ancient churches of the eastern Mediterranean. Armenian Christianity prospered, charting its own course as it navigated the troubled waters of neighboring Byzantium and Persia. This quest for independence did not, however, require the severance of commercial or cultural relationships with the Christian Byzantines or the Muslim world. For centuries, trade flourished. Byzantine emperors and Muslim leaders employed Armenian scribes. Armenians engineered defense systems and restored the dome of Haghia Sophia, the Great Church of Eastern Christendom. The medieval Armenian capital city of Ani — now a ghostly ruin just inside Turkey’s border with Armenia — demonstrates the architectural sophistication and artistic wealth of medieval Armenia. Described in contemporary chronicles as the “city of a 1001 churches,” Ani’s surviving churches are technical wonders, utilizing architectural devices — such as blind arcades and ribbed vaults — that would later support Europe’s Gothic cathedrals. Surviving frescoes and sculpted panels depicting kings and catholicoi, saints and angels, birds and crosses, reveal Arab, Byzantine, classical Greek and Persian influences. Even after the Ottoman Turks supplanted the Byzantines, capturing Constantinople in 1453, the Armenians of the Ottoman Empire thrived well into the modern era. Armenian catholicoi, patriarchs and bishops guided their eparchies, which until the eve of World War I numbered 52. But the rise of national movements throughout 19th-century Europe, which began in Ottoman provinces in the Balkans, significantly altered the position of the empire’s Christian minorities, especially its Armenians. The empire’s Armenian communities, whose aspirations were nominally supported by France, Great Britain and Russia, were violently targeted, beginning with isolated pogroms in 1894 and 1895. Eventually, these incidents spread throughout the empire, fueled after the Ottoman Turks entered World War I as an ally of Germany and Austria-Hungary. By 1923, some 1.5 million Armenians perished in what many today call the Armenian Genocide. Those who survived, perhaps a quarter of a million people, fled to Lebanon and Syria. Click here to learn more about this church, and how it has survived the violence of the last century.